I became a tad obsessed with the British crown at an early age. The first biography I read as a kid was about Queen Elizabeth I (her dad makes Meghan Markle’s dad look positively fantastic) and I, like much of the world in the ’80s, fell in love with Princess Di. I had my hair cut like hers, I collected magazines about her, and I still remember where I was when I heard the news about her tragic Paris car crash. My obsession has cooled as I’ve grown (now I’m just obsessed with The Crown) and so I’ve been following the Meghan Markle/Prince Harry gossip mainly as a distraction from the real-life horrors we face every day. But one particular aspect of the prospective marriage fascinates me, both as a lawyer and as a member of a former British colony: the idea of an American marrying into a family that has so many rules. And not just any rules–rules that they all take very seriously. On the one hand, the idea of this pecking order and being born into a particular position/status rankles me to no end as an American (and makes me glad we fought the Revolutionary War–although lately the idea of the Queen taking us back is tempting). The sexism in many of the rules also drives me nuts. On the other hand, the absurdist in me adores the adherence to such completely pointless, totally inconsequential rules. So as we count down Meghan’s final hours and minutes of freedom before being swallowed up by The Firm, let’s look at some of the rules that will impact her and her family for generations to come. Your Majesty, May I Get Married? First things first, Meghan and Harry wouldn’t have been able to get married if the Queen hadn’t okayed it. And obtaining her permission (not blessing) was not a foregone conclusion. Just ask the Queen’s sister, Princess Margaret (RIP). She wanted to marry Peter Townsend, a divorced man, and her sister (and later, the government) forbade it because of Peter’s divorce. Ironically, the Queen wouldn’t even be the monarch today if her uncle had been able to stay on the throne. But he fell in love with a divorced American and had to choose between the throne and her. He chose love. (Cynical note: There are also arguments that Wallis Simpson’s connections to the Nazis had an impact on the choice King Edward VIII was given. Pessimistic note: Can’t believe we’re still dealing with Nazis nearly a century later.) Of course, the Church of England, of which the Queen is the formal head, now accepts divorce (better than the beheadings that its founder, King Henry VIII, tended to rely on). So that obstacle has been removed, but the Queen still had to give Harry formal permission to wed because he is currently sixth in line for the throne (and was fifth in line for the throne, after Princess Charlotte, when he and Meghan first became engaged). That’s because there is literally a law that states that the first six people in the line of succession to the throne must have the monarch’s permission to wed. Insane, right?! So Prince Charles, Prince William, Kate and William’s three children, and Prince Harry all need the Queen’s permission to wed. The recent birth of Prince Louis, however, means that Prince Andrew (Prince Charles’ younger brother) is now seventh in line to the throne and there’s a decent chance he and Fergie may end up getting remarried now that they no longer need the Queen’s permission. Call Me By WHOSE Name? So this next rule is one of the really sexist rules. The way the rules work, only “blood” princesses (has anyone ever discussed adoption?) get to be called Princess X (e.g., Princess Charlotte, Princess Anne, Princess Eugenie). If you marry a prince, you actually take on their name and title. So technically, Kate Middleton isn’t Princess Catherine, she’s Princess William of Wales. Likewise, Meghan will technically be known as Princess Harry of Wales, although the odds are very high that the Queen will bestow upon Harry and Meghan the titles Duke and Duchess of something (possibly Sussex), so she’ll also have that name. I could go on for a long time because the rules regarding names and titles get very long and elaborate, but I’d probably still get it wrong because the rules are very technical. Suffice it to say, most royals, like our greatest celebrities (Madonna, Beyonce, Cher, Rihanna) don’t need last names but do like really long titles. Prince Phillip, for example, was born with the name, Philip, Prince of Greece, while his current full title is: His Royal Highness Prince Philip, Duke of Edinburgh, Earl of Merioneth and Baron Greenwich, Knight of the Garter, Knight of the Thistle, Order of Merit, Knight Grand Cross of the Order of the British Empire, Companion of the Order of Australia, Companion of The Queen’s Service Order, Privy Counsellor. This rule is sexist and petty, and it’s also exhausting to think of how hard this would be to remember at every family outing: it’s the rule for which royals have to curtsy or bow (really, that’s just a head bob) to other royals. And there’s an official order on this, which the Queen updated before Kate married William. It’s called the Order of Precedence and the Queen also updated it when Charles married Camilla, so she may update it again in light of Meghan joining the family. For purposes of establishing Kate’s rank in the hierarchy, the Order provides that she has to curtsy to the “blood princesses” (like Princess Anne and Princess Eugenie) if she’s by herself. If she’s with William, however, she “adopts” his rank and the blood princesses have to curtsy to her. (Family note: Ugh, I can’t imagine ever having to curtsy to any of my cousins or their spouses, no matter how much I love them!). This Order also impacts the order of arrival at events (just like celebrities at the Oscars!). Presumably, the Order will be adjusted so that Meghan’s situation is similar to Kate’s, although she’ll probably always have to curtsy to Kate (again, uck.). This rule makes me think of the story Michael J. Fox tells about sitting next to Princess Diana (technically Diana, Princess of Wales) for a screening of “Back to the Future.” Long story short, he had been told he couldn’t stand up unless she did first. Just as the movie started he realized he had to pee but didn’t move the entire movie because he was afraid of breaking that rule! Finally, assuming Harry and Meghan have kids, what titles and ranks will they have? That’s a tougher question. First, the British monarchy still has the sexist rule that titles are inherited through sons, which is part of the reason why some of Queen Elizabeth’s grandchildren are princes and princesses (e.g., Prince Charles’ and Prince Andrews’ children) but Princess Anne’s children are not. The Queen offered to bestow titles upon Anne’s children but she declined. Likewise, the Queen’s youngest son, Prince Edward, decided he did not want his children to have the royal titles to which they were entitled. Harry and Meghan could choose to follow either Andrew’s lead or Edward’s lead with their kids. On a related note, one slight improvement has been made to the rules of succession in Great Britain. Prior to the birth of Prince George, Parliament passed a Succession to the Crown Act that provided that the female offspring of an heir to the crown would not be passed over for a younger, male sibling. So that means Princess Charlotte does not lose her place in line for the throne to her younger brother, Prince Louis. The Act also softens, but does not totally eliminate, the bias against Roman Catholics. King Henry VIII’s feud with the Catholic Church isn’t dead yet! So all of this is just a fraction of what Meghan will have to deal with after this weekend’s wedding. She seems like a smart, accomplished woman who knows what she’s doing and it looks like she intends to use her newfound platform for good, which is great. I wish her the best of luck and hope everything goes well for her. And, as a mother and a daughter, I’m sad for Prince Harry that his mother won’t be there this weekend. I’m sad as a lifelong fan of Princess Diana too. 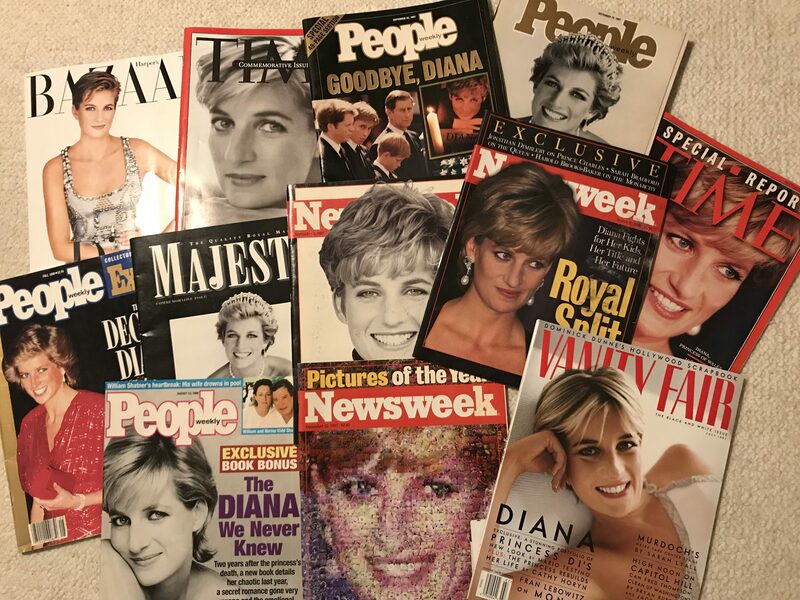 Just to show how obsessed I was with Princess Diana, here’s a picture of the magazines that I still can’t let go off even after all of these years. Some of them have even traveled with me from the East Coast to Texas to Wisconsin. She’s the only royal I really care about.